← The IQ in Music – Do Music Lessons For Your Kids Make Them Smarter? So, who are you? It’s not a trick question nor is it intended to insult anyone. Still the question begs to be answered. If you don’t know who you are, I mean deep within your heart center, what you want to attract, the life you want to live, the people or person you want to meet may very likely pass you by because you aren’t who you need to be. Most of say we “are walking our talk” and for the most part each and every one of us means just that. When I say for the most part we mean it when we say we “are walking our talk,” this is what we believe or are telling ourselves that we are doing. Each step along your path is a step in the right or in the wrong direction. So what is the right direction and how do we know if we are going in the wrong direction? In my way of understanding things and how they work, the right path is one that you feel passionate about. It’s the path that no matter what you feel compelled to take even when it feels or seems like you are so far away from reaching or achieving your goals of a better life. 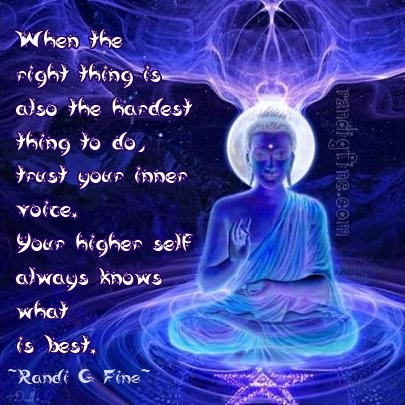 The right direction is where your Higher-Self is guiding you. It is, in part, about receiving Divine Guidance from Divine Source through your Angels, intuition or your gut feelings. It’s also about trusting the guidance and messages you receive. There is something that is very important and needs to be shared and understood. Whatever it is that you feel compelled to do, you must first become who you need to be, stepping into the fullest expression of who you are becoming to attract opportunities, clients and prosperity and abundance in the form of financial wealth, stability and security. It seems that whenever someone begins speaking, writing or referring to money energy, the “UnWritten Rule” of having to choose between being Spiritual and financially wealthy creates a sense of discord within our conscious mind and in our heart center. It was exactly that way for me for more years than I care to remember or even admit. The truth is when we struggle in any way for anything; our inner vibration is low, repelling our good, further delaying the fulfilling of our purpose. When we want for nothing, when we know that we are unconditionally and completely supported and abundantly supplied, we are much more able to fulfill our purpose. Again I ask the question, who are you? Who do you need to be to begin the life you are meant to live? Who do you need to become on the inside so that what manifests on the outside, in your life, in your business, in your bank accounts reflects who you are? Take time to figure out who you want to be, what you want to have, how much you want to make AND what you want to do. How do you want to help people? What do you feel passionate about doing to help others? What would your life look like when you are living your dreams, sharing your gifts, skills, expertise and your knowledge with others? It’s not about what you want… it is about who you are on the inside. Work from the inside out and the outside will begin to reflect what’s on the inside. Visit the Terrie Marie’s website for life-changing strategies, how-to-articles and 3 FREE Videos to help you start raising your wealth frequency right away! Gallery | This entry was posted in Life Coaching and tagged higher self, how to, how to access your higher self, how to find your life purpose, hypnosis lynn valley, hypnosis north vancouver, hypnosis west vancouver, hypnotherapy coal harbor, hypnotherapy kitsilano, hypnotherapy lonsdale, hypnotherapy lynn valley, hypnotherapy north vancouver, hypnotherapy west vancouver, hypnotist, inner calling, inner self, integrated health north vancouver, love hypnotist, meditation lonsdale quay, meditation lynn valley, ocean wellness north vancouver, spirituality north vancouver, yoga lonsdale, yoga lynn valley. Bookmark the permalink.